Have you ever been at the range and for once you’re taking some nice divots with your irons and wedges? Or even taking some small divots with your hybrids and fairway woods? What if the range doesn’t have those nice water filled buckets in them with the brushes to clean your clubs? Now you have to use a tee or even your thumb nail to get all the dirt and grass out of the grooves because you don’t have a brush on your bag. Well there’s a handy device called the Brush Caddy that could save your thumb nail from having to do that dirty job of cleaning out your grooves. Is it worth adding to your bag and having it become a part of your practice routine? Check it out. Keep your club head clean stroke after stroke. The Brush Caddy is pretty simple in its design and functionality. In this day and age where everyone is going green, the Brush Caddy follows suit. It’s made from partially recycled glass filled nylon that is pretty sturdy and solid. 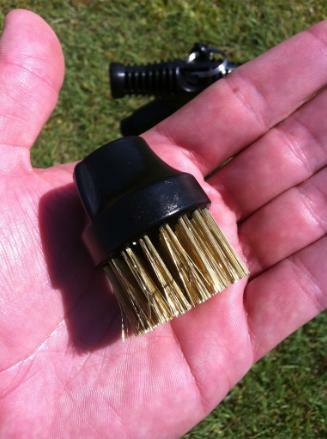 It has two different brushes, a brass bristle one for those times where you have a lot of dirt and turf on your club and a nylon one for those times where you only need a quick clean off of some grass or minimal debris on your club. The cool thing about these brushes are that they are removable and interchangeable and also replaceable through Brush Caddy’s website for less than $10 per brush. Portability is the name of the game for this handy tool and it comes with a bag clip that allows you to clip it onto your bag and take to the range. 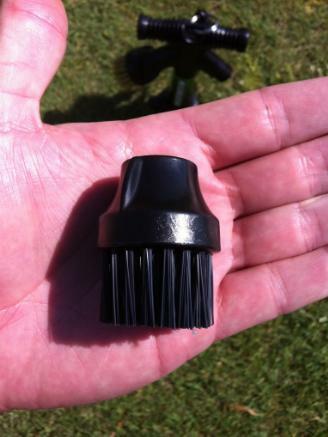 I wouldn’t recommend leaving it on your bag though as it is a little cumbersome for a permanent spot on your bag and the elongated spike that anchors the Brush Caddy to the ground could be a safety hazard. Definitely don’t forget to take it off if you decide to travel with your clubs because the TSA may not let it on the plane. My first thoughts on the Brush Caddy were, ‘this is pretty cool but can it really work?’ It’s a well made and sturdy tool that is not heavy at all. I was intrigued by the compactness and versatility of the tool but just wasn’t sure if it could do the same job that is performed by smaller two-sided brushes that are also available. Only one way to find out, off to the range for some THP testing! Sticking the Brush Caddy into the ground is a breeze with the help of the spike and the contoured grip that let’s you push the Caddy into the ground until the stabilizing fin let’s you know when it’s ready to go. Testing the Brush Caddy would be pretty straight forward right? The results are there for you to see instantly, it doesn’t get any easier than that and there’s very little objectivity or subjectivity. Either your clubs are clean or they’re not right? So how may swipes does it take to get the face of your favorite club clean? Let’s review. If/when I take divots they usually are not the deep variety and tend to be thinner and usually have more grass than dirt to them. For these type of divots I found the Brush Caddy to be a perfect fit for my club cleaning needs. It was real simple to make my shot, lean over with the club, pick which kind of brush I needed, clean, and see the results. The nylon brush was great at removing the grass and light dirt found on the club face, grooves and even the sole of the club. The brass wire brush was efficient at removing debris from the club face, grooves and the sole of the club as well. However, one thing I noticed was that if you had a lot of debris on your club face from either a nice divot or because you don’t habitually check your club face for debris after each shot you take, sometimes the Brush Caddy didn’t deliver with a quick clean. In order to really ‘deep clean’ your grooves you sometimes need a little leverage to apply some elbow grease when using the brass wire brush. The Brush Caddy doesn’t always offer the right amount of resistance to get the brass brush deep into the grooves for a complete cleaning. There were times that I needed to bend down to angle the club face to the brush and push the club face into the brass brush in order to make sure that it was getting in there and doing its job. This wasn’t always the case but if you are one that doesn’t always clean your club this could be problematic for when you do decide to clean it. If you regularly check and clean your club after each shot like me, then this may not affect you as much. This would not preclude me from purchasing this but you may want to assess your own cleaning habits to determine whether this will benefit you or not. Something that I did notice was that my range sessions were a little more efficient from time being saved due to how my clubs were being cleaned. I have a double sided toothbrush type of brush on my bag that I’ve always used and have replaced a few times. When using that I had to step away from my hitting stall, get the brush and clean my club, then get back into the hitting stall and take another shot. If I hit another shot that required cleaning I’d have to repeat the cycle all over again. With the Brush Caddy I found myself hitting my shot and only having to move a few inches to lean over and have it clean off my club. It’s a definite time saver and very convenient to have along with you. Let’s review. Portability? Check. Versatility? Check. Efficient? Check. Sounds good so far doesn’t it? The price tag for this handy little tool is $24.99 which I think is just ‘OK.’ That being said I think this tool delivers on something that isn’t advertised but could be the most valuable thing, awareness. If you’ve never thought to look at your club after each shot or even every other shot, the Brush Caddy will instill in you the habit to always look down at the club face of the club in your hand and see if it needs cleaning or not. If anything, the Brush Caddy is worth the investment just for this factor. Never mind the fact that your clubs will look great and that you may actually enjoy practicing more knowing that your clubs are clean and will perform better without having that ‘bad shot taste’ in its grooves. Think of how many shots around the green that you’ve missed that could have ended up differently if you had thought to clean your club? What good is it to worry about conforming grooves or not if you don’t clean them? A clean club is a happy club and a happy club could make you happy too with some potentially lower scores on your score card. 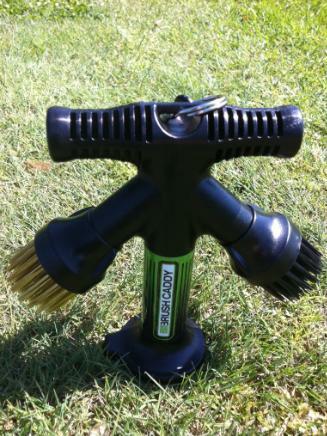 For more information on the Brush Caddy, click on over to www.golfbrushcaddy.com. Great review Todd. I like my Groove Tube though. It’s a small tube filled with water with a nylon brush at the end and really keeps my club heads clean. Very good review Todd!! I am not sure this is something I would seek out and purchase. I do not like the thought of having a spiked object hanging from my bag, just asking for trouble there I think. The two sided brush I presently use is clipped onto my bag is very easy to use. 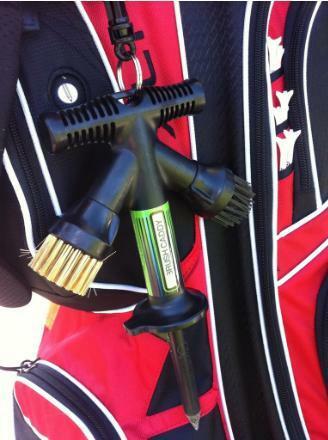 It adds the feature of a retractable groove cleaner which is great for me wedges and irons. I think more though needs to go into this item. Nice review Hanks. I think this would be a cool feature for ranges to add. I am not sure if I would take it with me to the range each time, but if it was already there I think I would use it. Thanks for the great review. Very interesting device. I do like the idea of having something so handy to clean my clubs on the range. I think I’d be more apt to clean them often with something so handy. Nice job on this, Todd! That is one serious brush. Thanks for the review Hanks. Very good honest review . Thanks for that Hank’s. I’m one of the crazy people that clean clubs after every shot. Nice review Hank! This is a very interesting tool no doubt and once i find the time to spend more time on the range then would make a great addition. very solid review Todd! It sounds like it could be useful to use on a range. I really like the idea of this. Great review Todd. I usually just clean after my session or use the towels I have but I really like this idea. Worth looking at some point down the road. Good review. I always have my copper brush attached to my bag. I try to have a wet towel also. But just for grass or a little dirt at the range, it sounds like it would do the trick. I use the two sided brush and a wet towel. When this came up for testing, I was more interested in how well it stayed in the ground.I guess since it wasn’t mentioned that it was a problem, that it stayed in the ground even with the upward pressure when cleaning the club? I used to have a brush attached to my bag, but I found it a hassle to go back to the bag sometimes if I’m powercarting. I ended up getting a Groove Doctor 2 .. a tiny retractable brush that holds brass, plastic brushes and a groove cleaner in something the size of a box of matches. Fits in my pocket so I always have it. I don’t see really much benefit to this over my handy little brush I already have that was like $5. I stick it in my back pocket when at the range. Todd, thanks for a very professional review. Much appreciated. I’m Robert a new member on THP and owner of Brush Caddy. I’m more than happy to answer any questions you may have about my product. I addressed a bunch of questions on a forum thread so please check it out. I wouldnt pay that much for a brush. Good review though. Solid review Hanks. Sounds quite handy to have if your range is a grass range. Thanks for the great review Todd. I think the company missed the mark by a little with this product. Too big…too expensive and it looks more like a sci-fi self defense weapon than a club cleaner. I could see where that pointed spike could cause some real damage. Snooker is always the best hobby regardless of anything. Congrats to Ronnie for achieving his 11th maximum. Simply too addicted to it.